TGIF everyone! Big shop update happening later this afternoon, just in time for the long US holiday weekend and perhaps a little shopping. I've got lots of new products going up in the shop today. 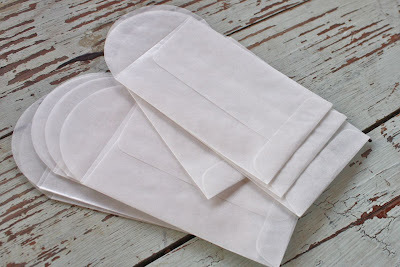 I'm going to give you a sneak here on the blog and have the items up later today. Then...in upcoming blog posts I'm going to do a product focus on the new items. 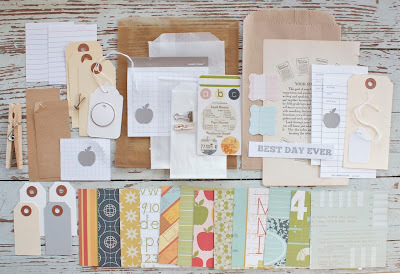 Lots of new paper items, lots of new packaging items.....just in time for the holidays. I'm determined to get an early start this year so I'm adding items to the shop early too. First up is a brand new card kit. These have been so well received and sell out pretty quickly. Each new card kit is offered in very limited quantities with all new cards designs and unique embellishments. 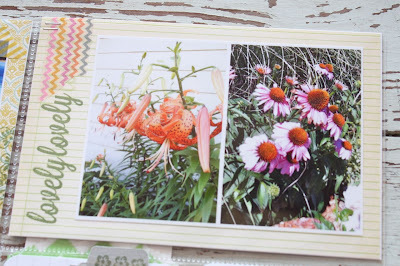 They are just perfect if you want to sit down and make a batch of cards to have in your stash. I'll be featuring the card kit in more depth in a blog post tomorrow + I'll chat about how to use the cards for possible Christmas/teacher gifts. This new card kit is called My Type of Friend and features Elle's Studio notes, an exclusive sheet of tiny typewriter Instagrams, a full roll of measuring tape Washi tape, October Afternoon patterned paper, stamped sentiments, buttons, twine, my waxed paper sack packaging and more. I'll have full photos and more details in tomorrow's blog post. Probably will be one of my favorite kits evah! Okay, just too cute for words. 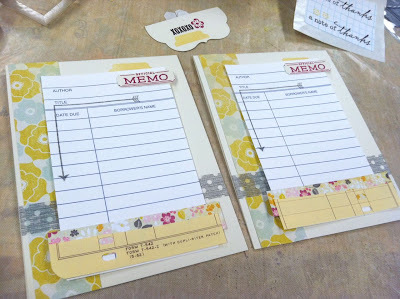 My new, handmade Office Memo Envelopes. 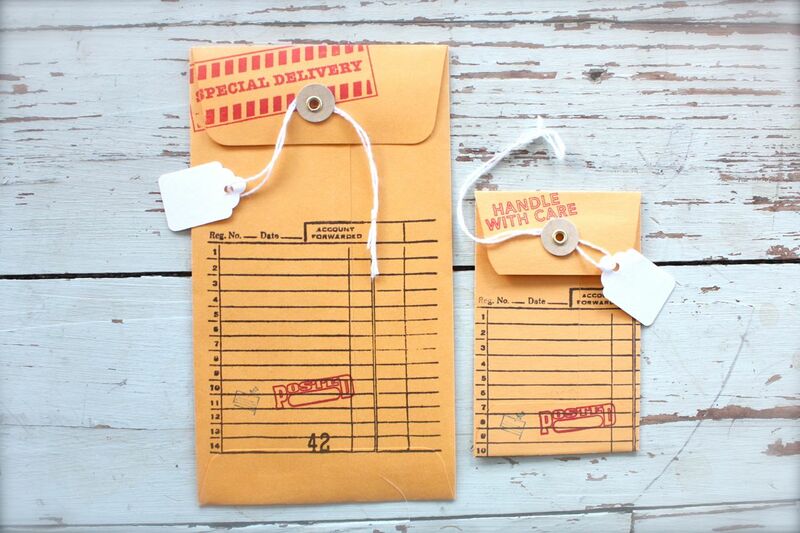 Features one large and one small interdepartmental delivery type envelopes. The large one measures 6" tall and the small one measures 3.5" tall. 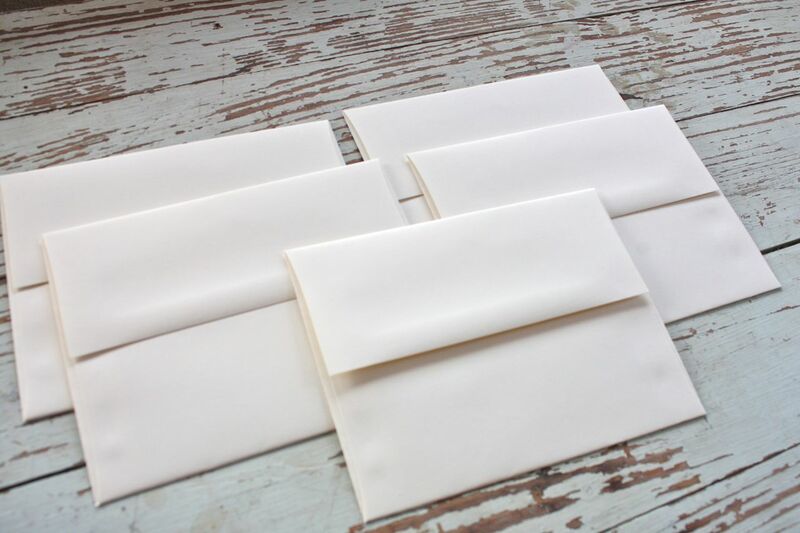 They're hand stamped and have the detailed closure features of the real life size envelopes. These will be offered in very limited quantities. Just think of the possibilities. On to some packaging items. New, large sizes of the glassine sacks. 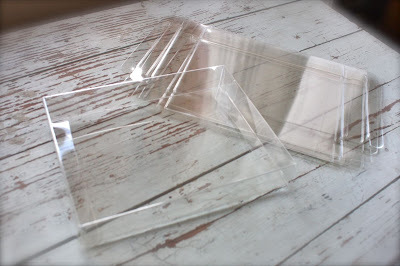 New clear card boxes that will hold A2 size cards and envelopes. 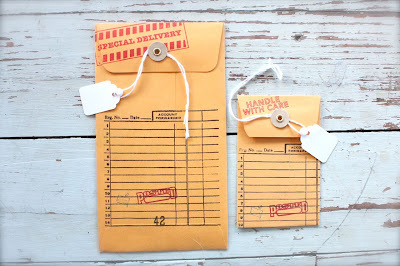 I absolutely love these little gems for packaging up cards as gifts. I'll be showing fun packaging items all through the holiday season. 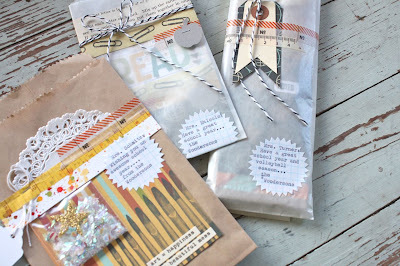 Perfect to package up my card kit creations too. Very sturdy and good quality. 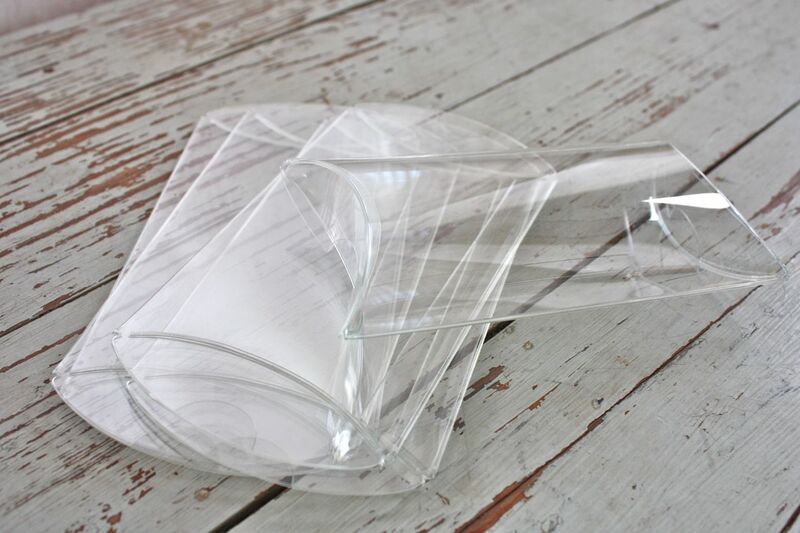 New clear pillow boxes. 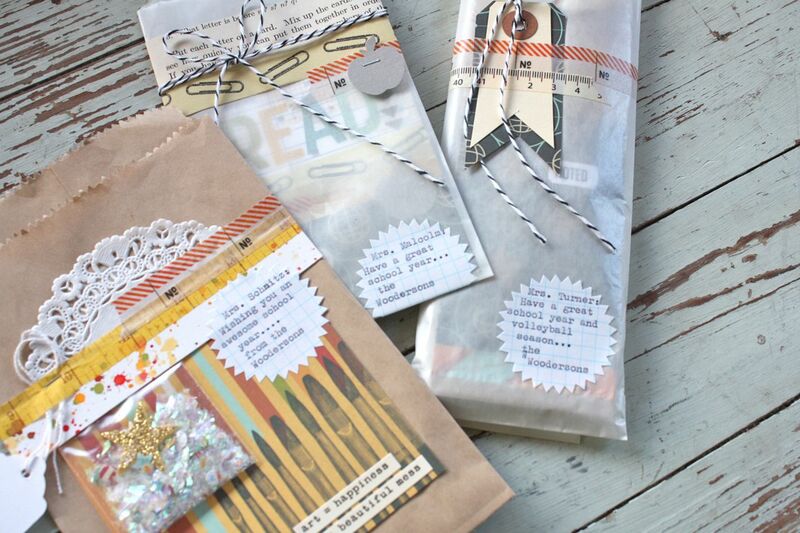 These are so fun and will perfect for packaging up small gift items for the holidays, birthdays, teachers and more. They measure about 5" long. How cute will little lip glosses or small packaged candies look in these babies? Tiny little clear bags for holding the small of found items or perfect for creating confetti bags to use on cards or any of my packaging items. Just wait til you see what I have planned for Halloween using these little goodies. 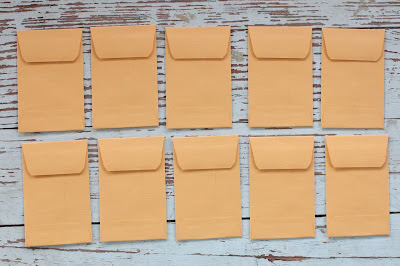 Cream envelopes in A2 size, just in case you want to use regular envelopes with my My Type of Friend card kit instead of the waxed paper sacks. Nice smooth finish and great quality. Vellum envelopes in A2 size. 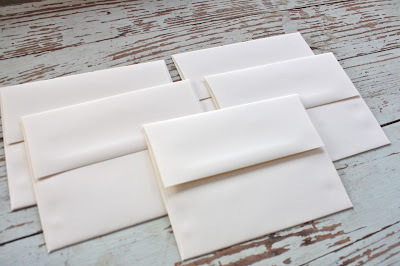 Vellum is back and I think cards look sooooo pretty in a vellum envelope. 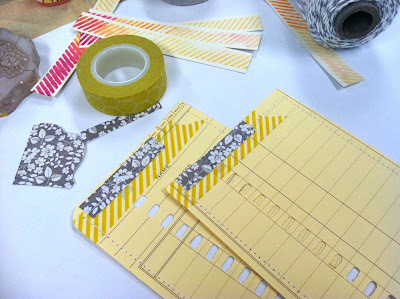 Add washi tape or tie up with baker's twine or a pretty ribbon. Perfection. 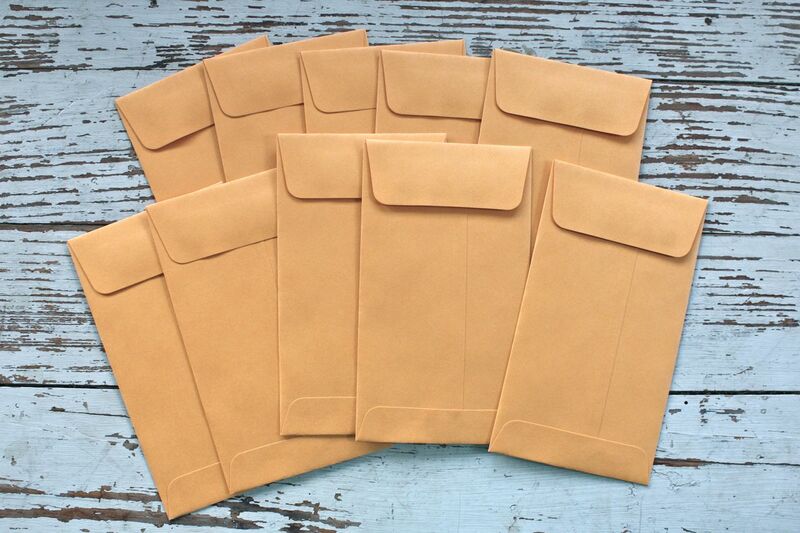 Small glassine envelopes with a fun rounded closure. 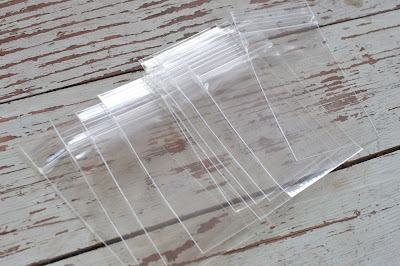 Gazillions of uses for these, think Project Life, cards, scrapbooking or fun gift packaging. 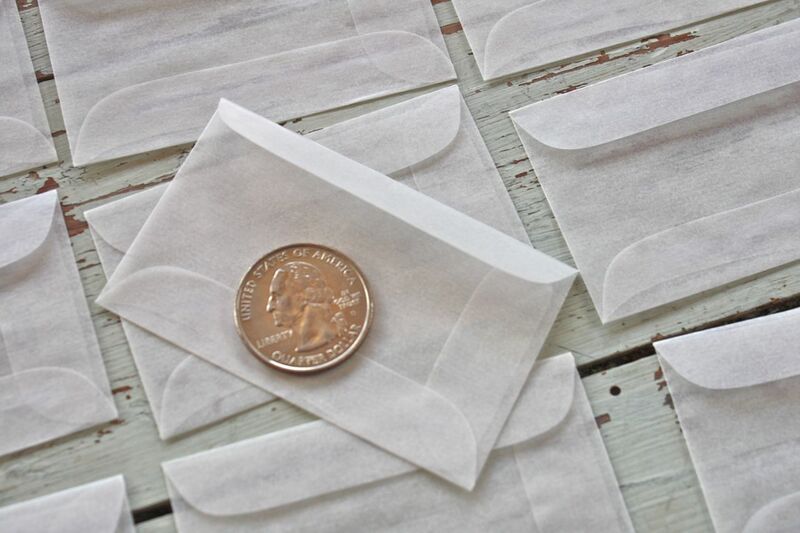 The tiniest of glassine envelopes to capture little bits and pieces. I can't wait to use these on Project Life pages. 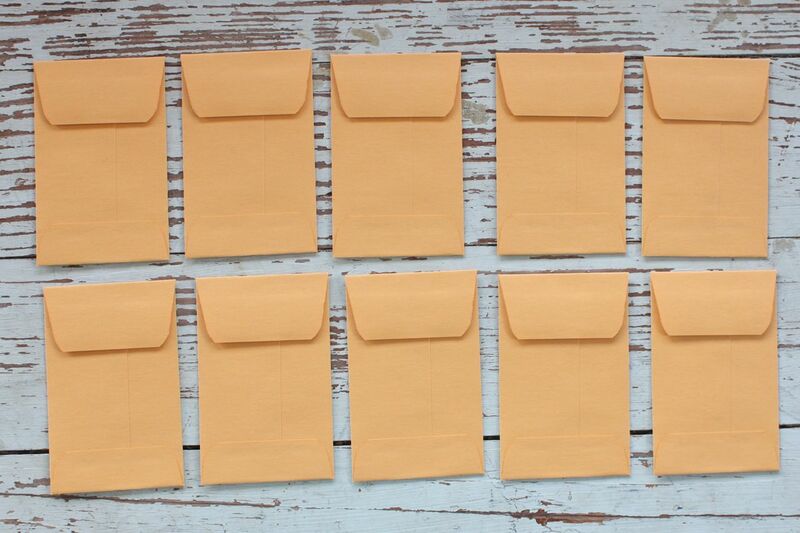 Small manila coin envelopes for the office supply lover in us all. 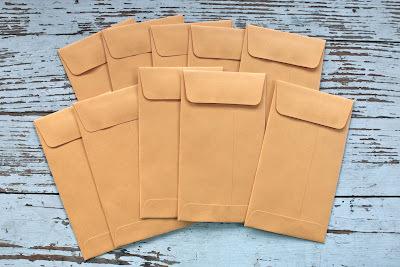 Large size manila coin envelopes, perfect for unique card packaging and more. Then remember.....stay tuned for fun blog posts featuring all the new items. Tomorrow I will have a full blog post featuring the new card kit and all it's fantastic details. So, so excited to share all these new goodies with you. Thanks for stopping by. We're back in full swing with school now which reminded me I needed to share a few more projects I made using my 2 Squared School Kit. I used up all of my original kit making the projects I've shown here on the blog but I pulled a few extra papers from my stash to create a few more school themed projects. I had all my goodies ready to go but realized I forgot a few people. For the girls' English teacher, I created another bookmark using a library card, a medium glassine sack and papers from the kit. 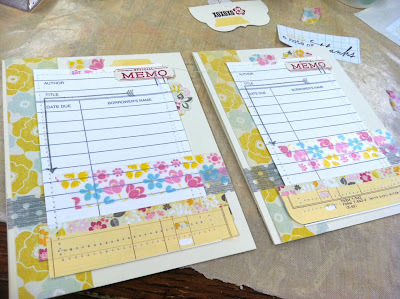 The sticker letters are from October Afternoon and stamps are from Studio Calico. 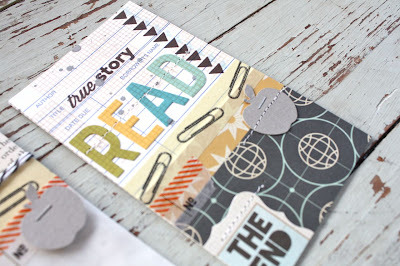 LOVE creating bookmarks from the library cards. Next up I made 4 notebooks from a stash of notepads that I had. These will be for my four mom friends. 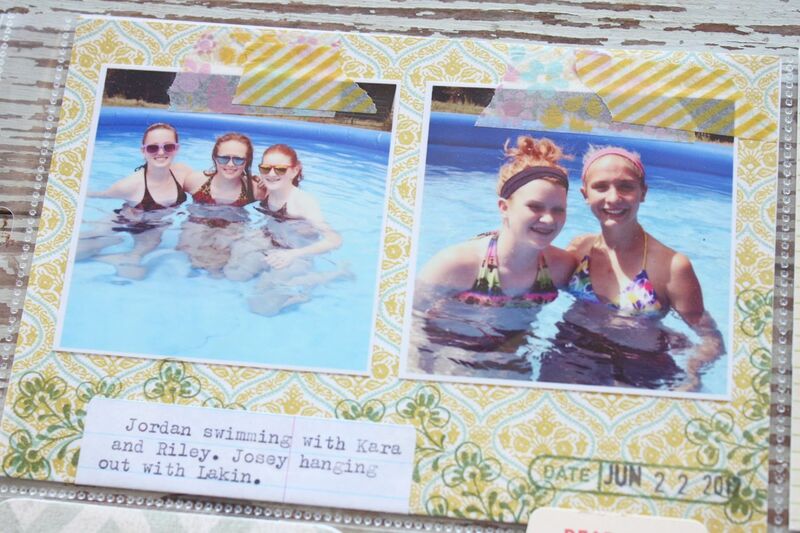 A few of them are so nervous about having high schoolers now, I thought a fun notebook would be a nice gesture. I used My Mind's Eye Kraft colored Everyday Fun papers from the 6 x6 Paper Pad for the notebook covers. (Edited: the papers were actually from the 12 x 12 sheets from this line). 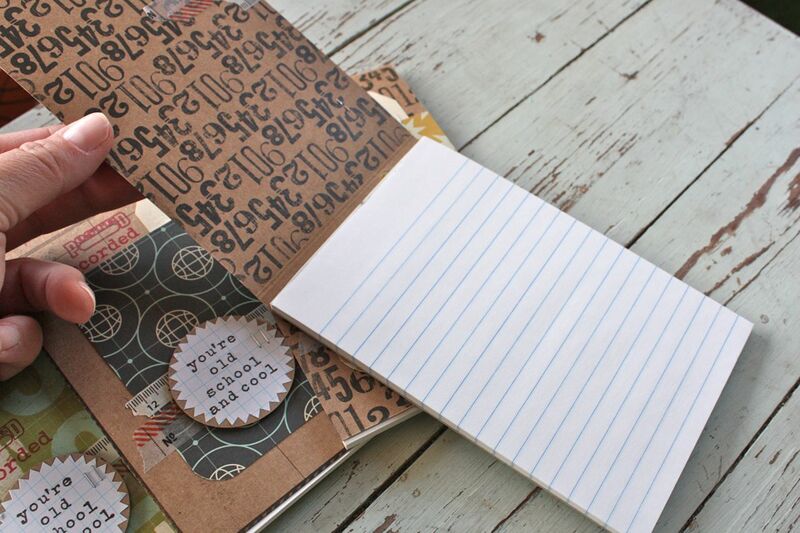 This particular style line is very thick so the papers make excellent notepad covers. 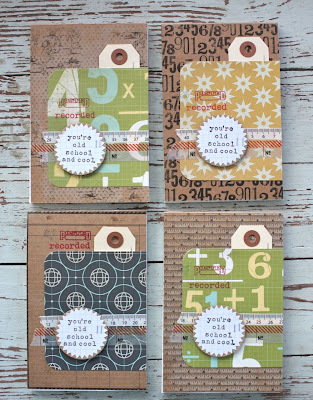 For the patterned papers, I chose some of the 4 x 4 squares from the kit and trimmed them down and rounded the corners. 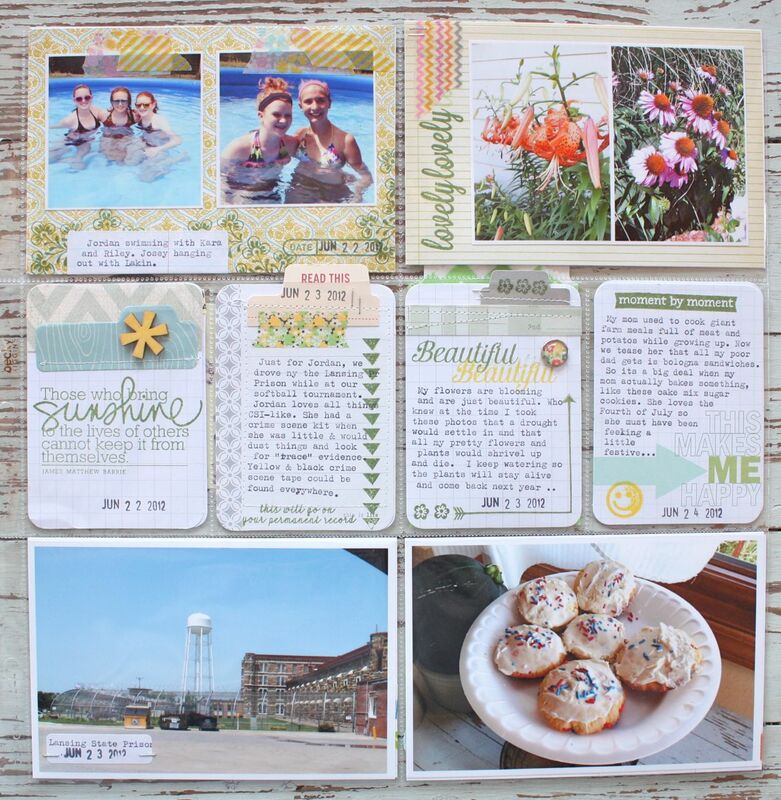 The stamped starburst label is from the kit and they're also sold separately in my shop. Washi tape from my stash was adhered under the popped up circle. 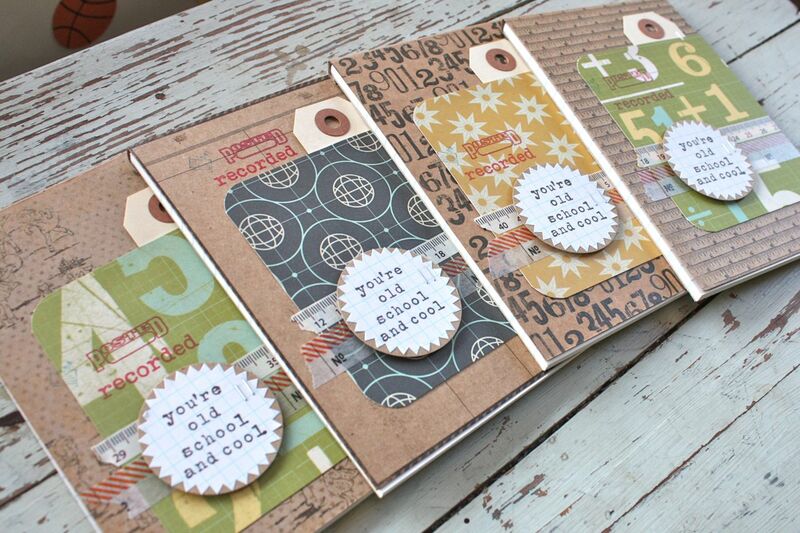 Small parcel tags from the 2 Squared School Kit were tucked under the patterned paper. The inside notepad is just a simple lined pad from an office supply store. And as a little extra for some other gifts I already had made, I typed on some additional starburst grid labels and stuck them on the packaging. And just like that, I was good to go. 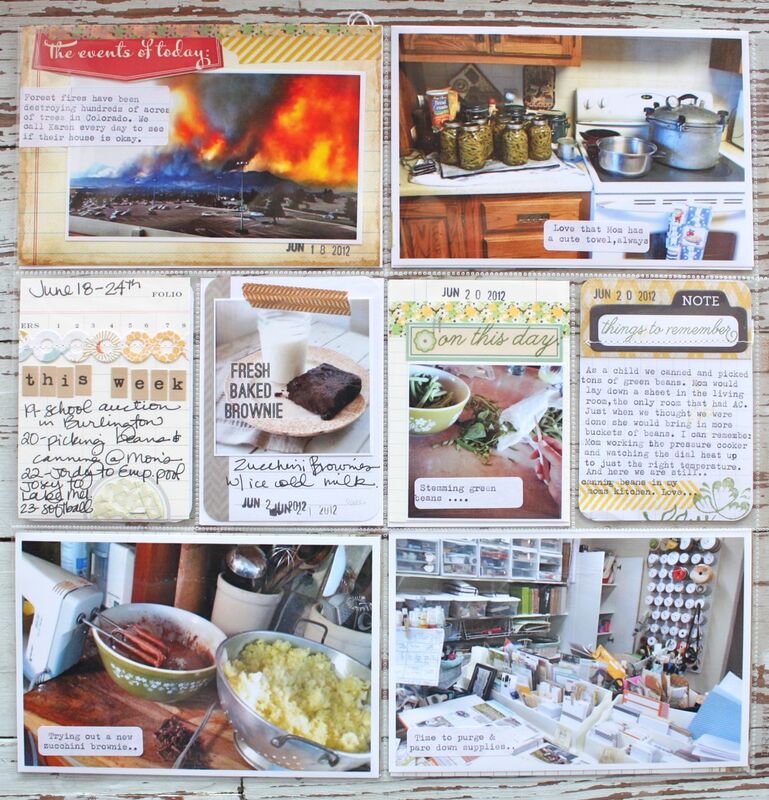 I have 3 weeks of completed layouts to show you. Plus I'll talk a little bit about how I'm going to approach the inserts I still to add. These have been very well received and I'm having a blast finding just the right papers and embellishments to add into the kits. All with a little handmade flair. One of my favorite kits is coming up. It's time for the holidays to be creeping up on us. I have a few fun Halloween finds that I'll be adding into the shop. 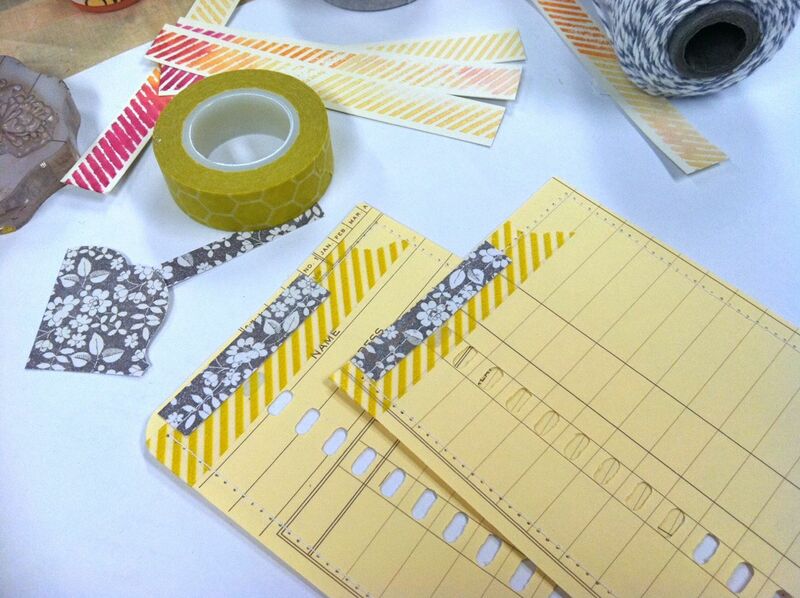 Plus I've been stocking up lots of orders for a fun shop update with lots of new items for card making and more. With the new school year comes a renewed desire for me to get more organized around the house. I'll be sharing some menu planning and cooking ahead ideas. I also just had a huge garage sale. I'll tell you all about my new decorating plans for the house. Okay, I'm off to the girls' first volleyball game of the season. Gotta run! Go Lady Cats!! 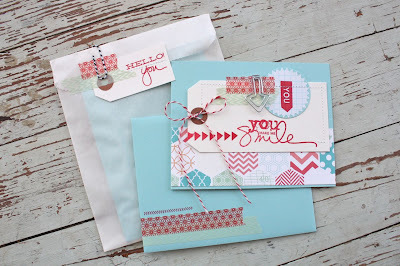 Hey there, back today with a few cards made from the Aqua Cards & Envelope Kit. 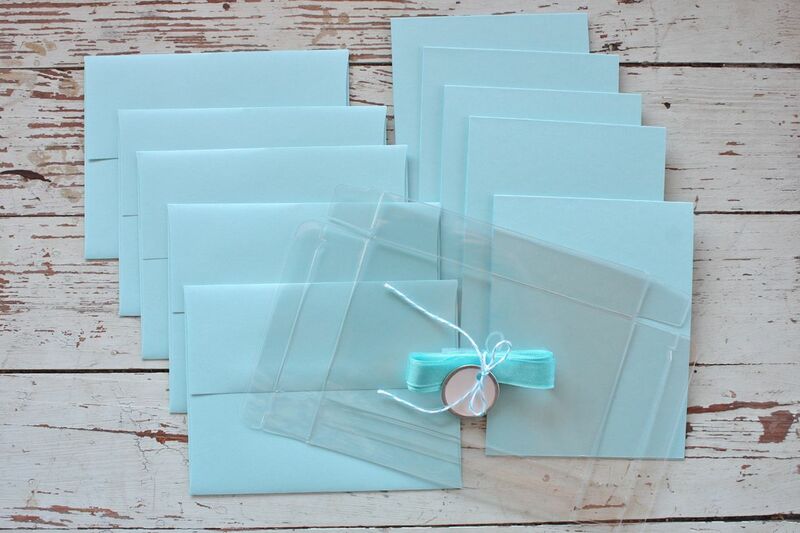 The kits come with aqua cardstock bases + coordinating aqua envelopes, a clear cardstock box, aqua seam binding, a metal tag and aqua/white baker's twine. These along with the main card kit were featured in yesterday's post. 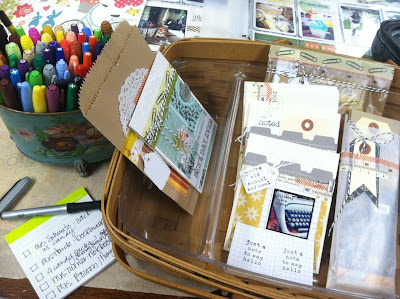 If you ordered this kit, it's designed for you to create your own cards and then package them up in the clear box for a gift. There are 5 card bases/envelopes which will fit inside the clear box if not bulked up too much. Then you can tie the seam binding around the box and make a bow....then tie the metal tag onto the bow with the baker's twine. 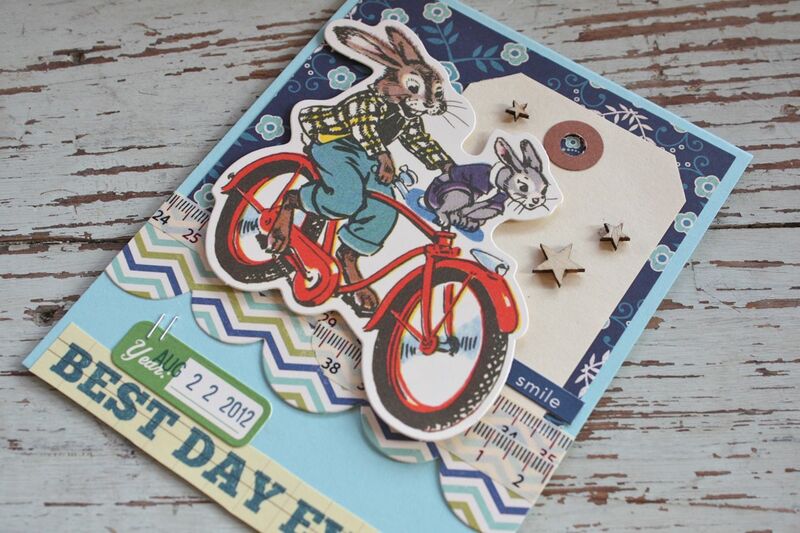 The possibilities for your card design, patterned papers and embellishments. 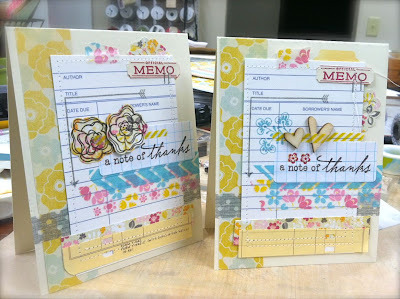 I thought I'd show you two cards that I made today using the aqua cardstock and fun new October Afternoon Woodland Park accents. My first card is one that will go into my card stash for one of our moms. 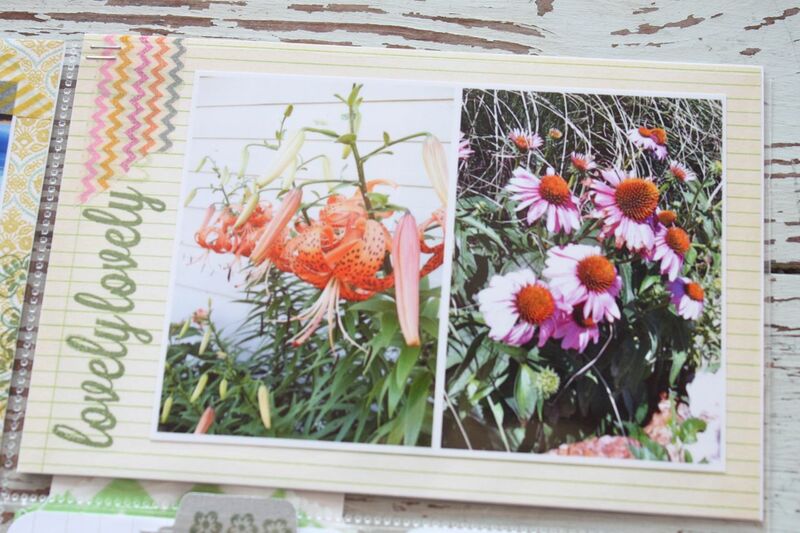 They like floral cards that kind of generic in nature. This one is blank inside and the outside sentiments will be suitable for a birthday, congratulations, etc. 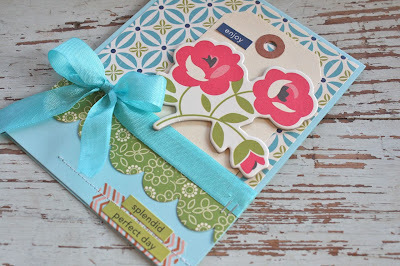 The main accent for this card is a big chipboard flower from the Woodland Park Chip N Stick Sheet. 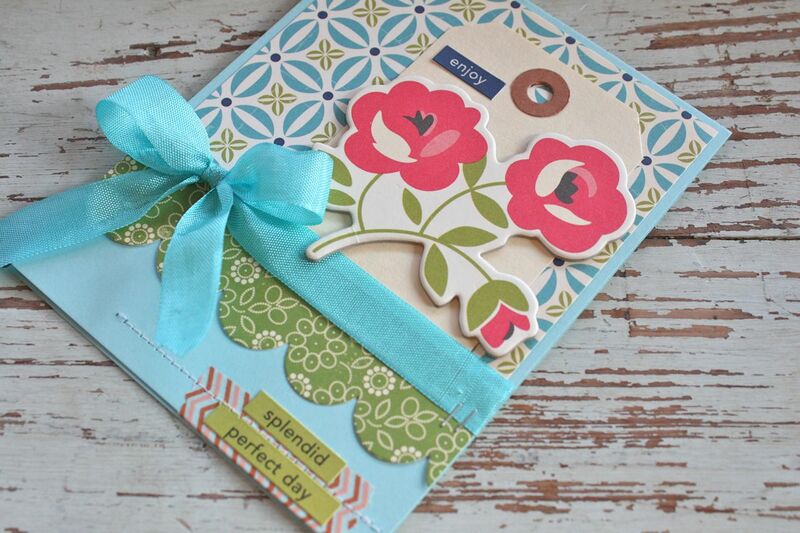 If you get stuck as to what to use those big pieces for, they make perfect focal points for cards. The chipboard is adhered to a Large Manila Parcel Tag with an October Afternoon sticker word stuck on. 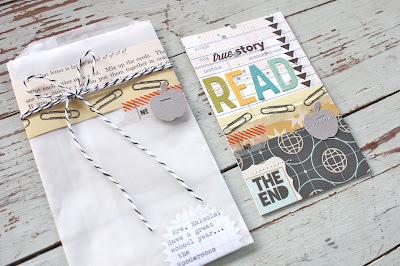 More sticker words were added to the bottom of the card along with a strip of the Woodland Park Chevron Washi Tape. The patterned papers are both from the 8 x8 Paper Pad and the seam binding is the color that comes with the kit from my shop. Medium Scalloped die is from Papertrey Ink. For my next card, I needed a fun card for my little nephew who started 1st grade yesterday. 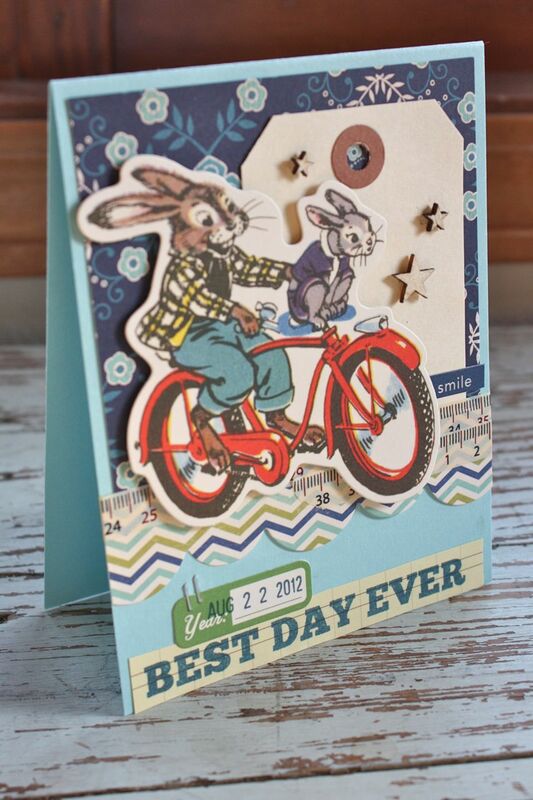 I thought this bunny on the bicycle die cut from the Woodland Park Miscellany pack was adorable. It's popped up on top of another Large Manila Parcel Tag with wood veneer starts from Studio Calico. Both patterned papers are from the Woodland Park 8 x 8 paper pad. You'll really love this line if you're a lover of the color blue. 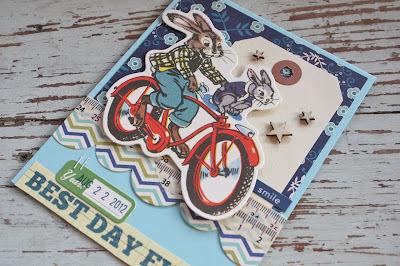 And a funny little coincidence.....after I made this card for my great-nephew, my niece posted a photo in Facebook with Nick on his bicycle asking if he could ride it to school. How fun is that!? That's it for today's projects. 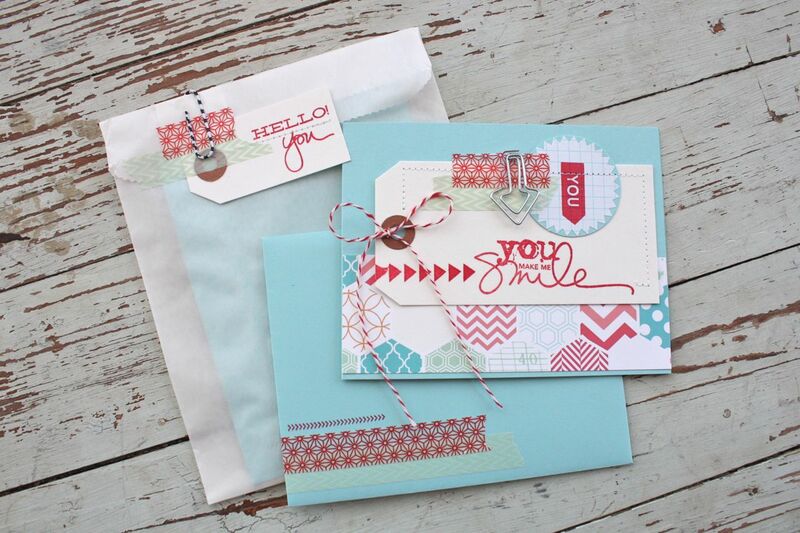 The Aqua Cards & Envelopes Kits are nearly gone. The You Make Me Smile Card Kit is just about sold out as well. I've gotten lots of nice notes about this kit so I think you'll enjoy it. For those who have already ordered, all orders are shipped as of this evening. If you like this card design, I have a few kits with the same tags and accessories that you can use on some card designs of your own. 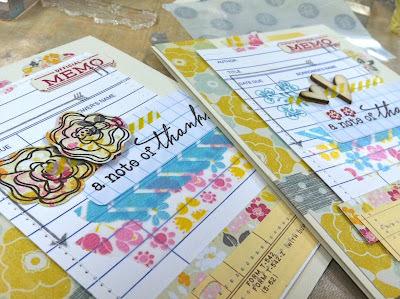 And remember, if you'd like your card kit to have the items stamped, be sure to add on the Happy Stamper Add On Kit with your order. Edit: Kits are now in the shop. :) And yes, I ship everywhere. 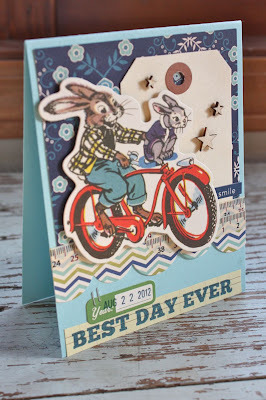 I'm back today with another card kit that will be going up in the shop later today. My last kit was very well received so I hope those of you that purchased the kit had fun assembling it. 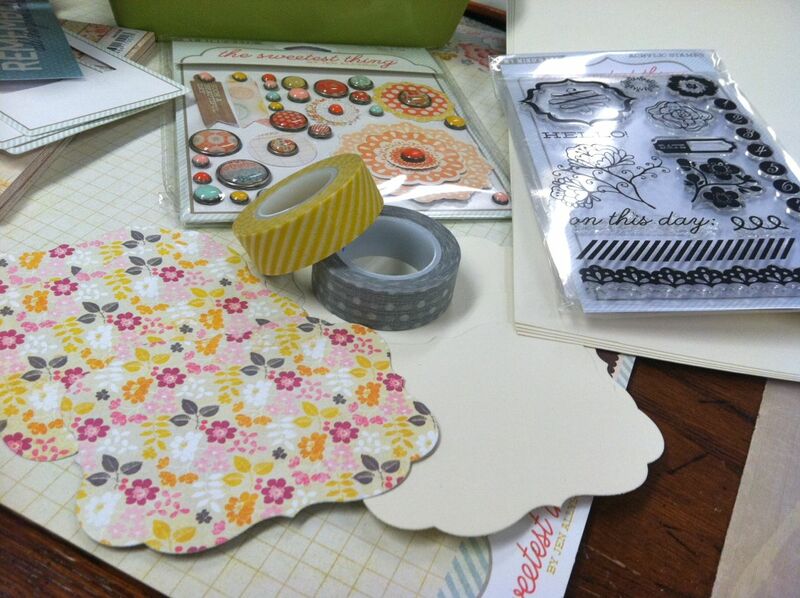 Today's kit is called You Make Me Smile. Note: Kits will arrive with NO stamped images. 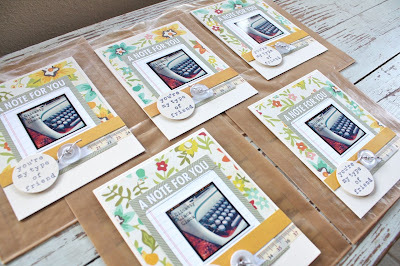 Some of you have expressed that you like your pieces plain so that you can use your own stamps. I will have a "Happy Stamper Add On Kit" in the shop that be purchased if you want me to stamp your items with the same stamps I used as shown below. No other stamps will be substituted, sorry. Kit comes with unassembled pieces, enough to create 5 completed cards with envelopes + 5 gift sacks like you see in the photo below. An instant addition to your card stash that you can put together very quickly. Please refer back to this blog post for photo reference on how to assemble your cards and some helpful tips. This is the card design for the kit. 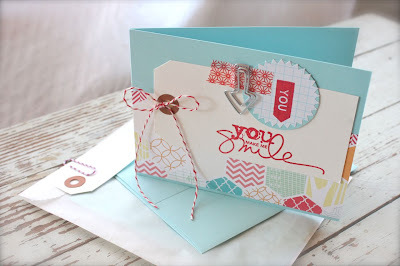 The card has an A2 aqua card base using 100 lb sturdy cardstock with coordinating A2 aqua colored envelope. 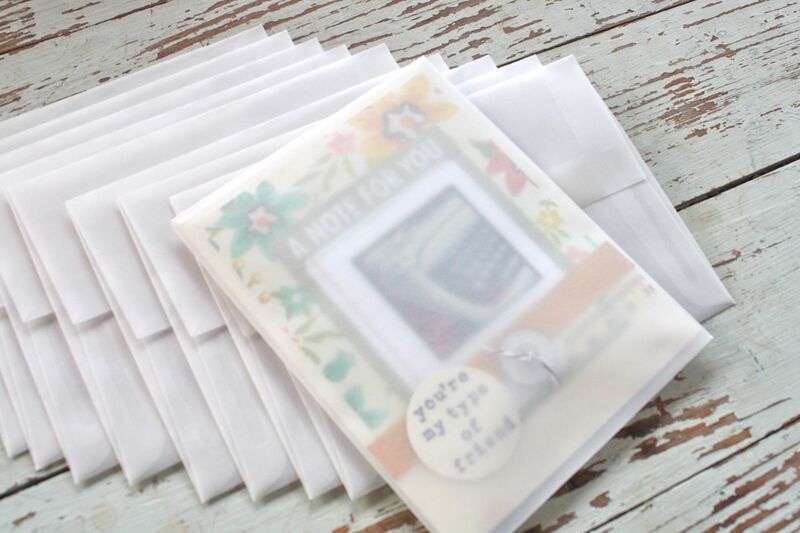 Each card will fit into a large glassine, flat sack that can be secured with a Small White Parcel Tag and colored paperclip. In the sack you can slip a candy bar or additional small gift and use it along with the card. Or you might choose to mail the cards just in the envelope and use the gift sack for another use. 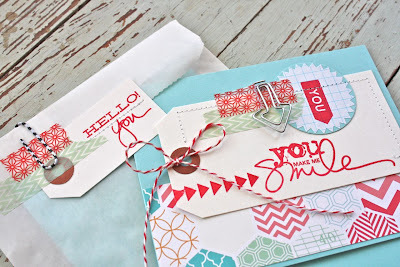 The fun card design features a Large White Parcel Tag that is stamped with an Ali Edwards sentiment from Technique Tuesday and tied with red/white baker's twine. My favorite part about this card design is the circled layered with a Starburst Grid Paper Label, Washi tape, the Studio Calico arrow "you" stamp and the arrow paperclip. 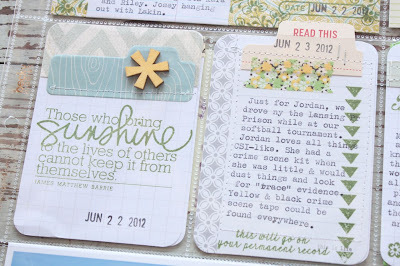 Again, please note that your kit will arrive with no stamped images unless you purchase the "Happy Stamper Add On Kit". 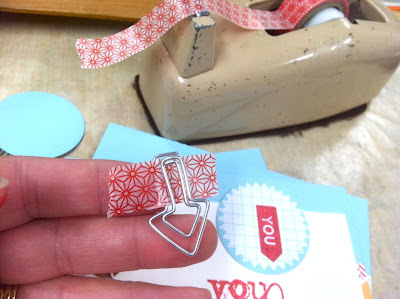 Helpful hint: When assembling the Washi tape and the arrow paperclip, just peel the Washi tape off of the clear plastic and weave it through one opening of the paperclip. Then flatten it all out and adhered to card front. You'll get 5 pieces of torn Washi tape to complete your 5 cards. Assembling the cards is a breeze. Simply use your own adhesive to adhere the pre-cut Echo Park Large Hexagon cardstock pieces to the horizontal card fronts. 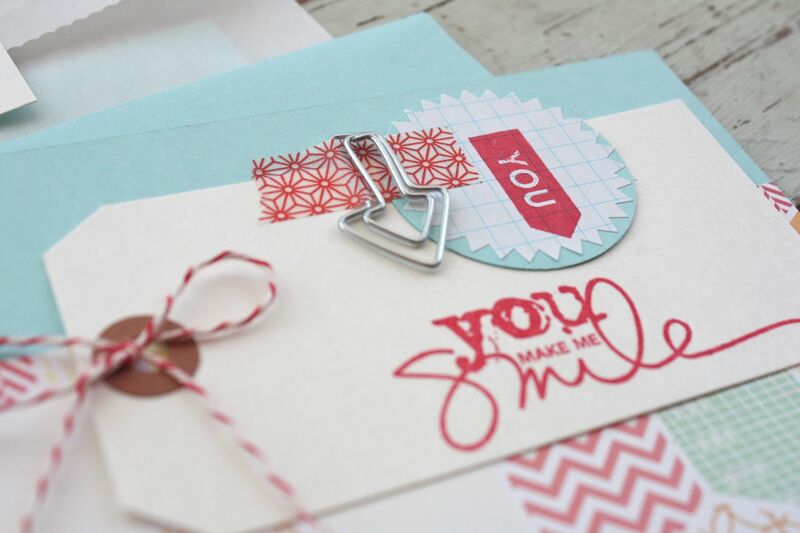 Stamp your large tag and Starburst label (or if you order the Happy Stamper Add On Kit, these pieces will be stamped for you). 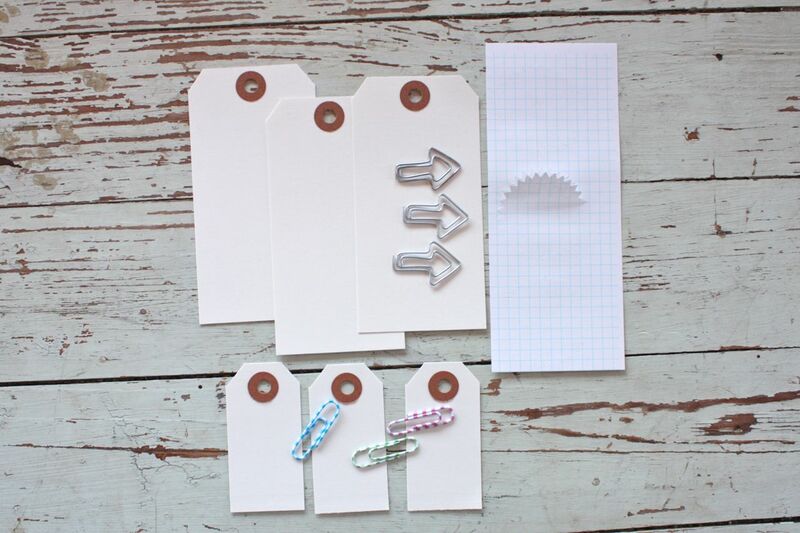 Tie the large tags with baker's twine. Adhere tags over patterned paper. 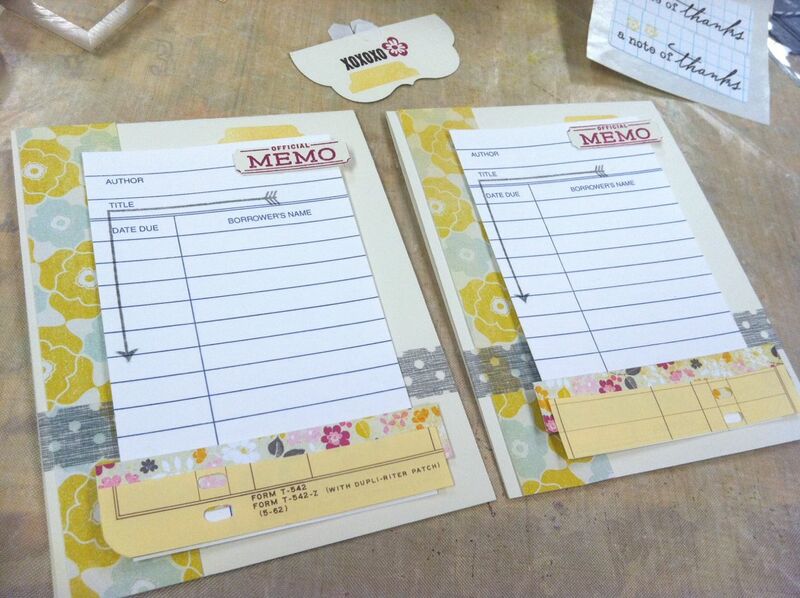 Stick labels to punched cardstock circles then adhere over large tags. Adhere the Washi/paperclips. 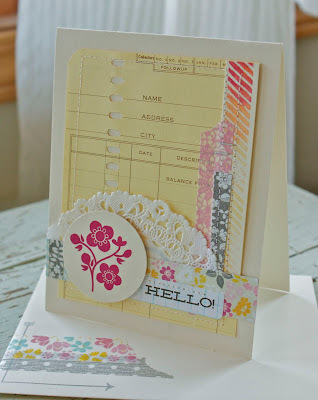 If you'd like to try your hand at creating this card design but want to use your own cardstock and patterned paper, then I will have a limited supply of Tag Kits in the shop also. 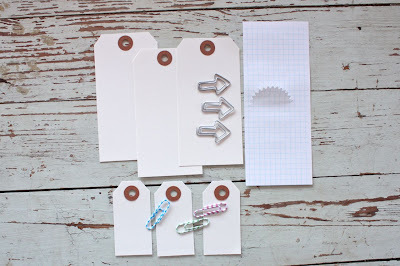 There will be enough large & small tags, arrows, starburst labels and paperclips to create 3 cards. You supply the cardstock, patterned paper, sacks, etc. 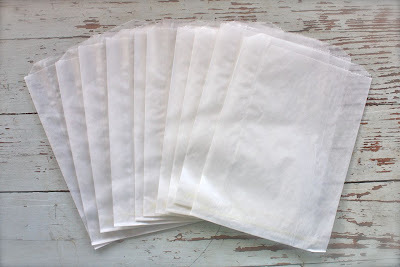 If you'd like to try other card packaging I have Waxed Paper Sacks which have been very popular and my Large Kraft Sacks too. 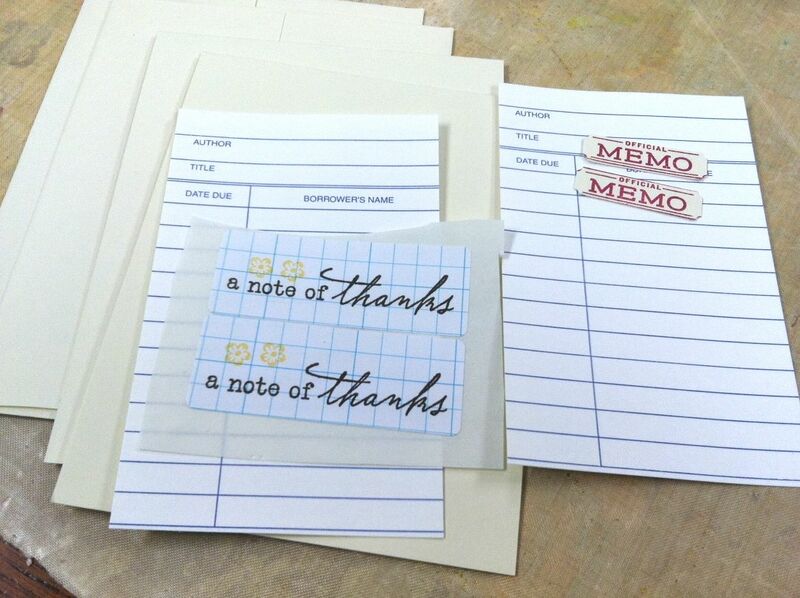 The Starburst Grid Paper Labels are available in a quantity of 10 also. As with my last kit I will be showing a sample of how you can use your own supplies to further embellish your kit items to create more detailed cards. 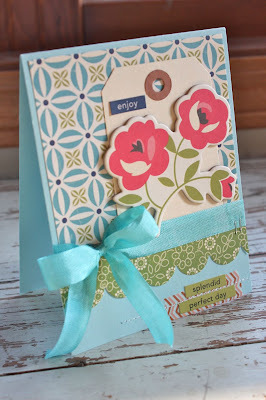 Here I used additional Studio Calico and Ali Edwards stamps, machine stitching on the tags and additional Washi tape to fancy up the card, the gift sack tag and the envelope front. Sometimes less is more.....but sometimes you want a little more bling. 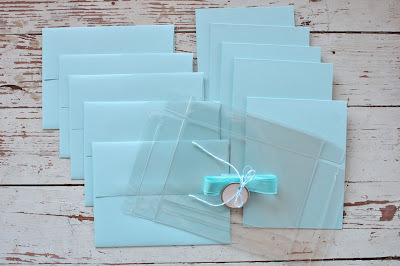 One last add on that I'll be adding to the shop today is a set of 5 A2 sized aqua card fronts and coordinating envelopes, along with a clear card box, a yard of aqua seam binding and a metal rim tag. 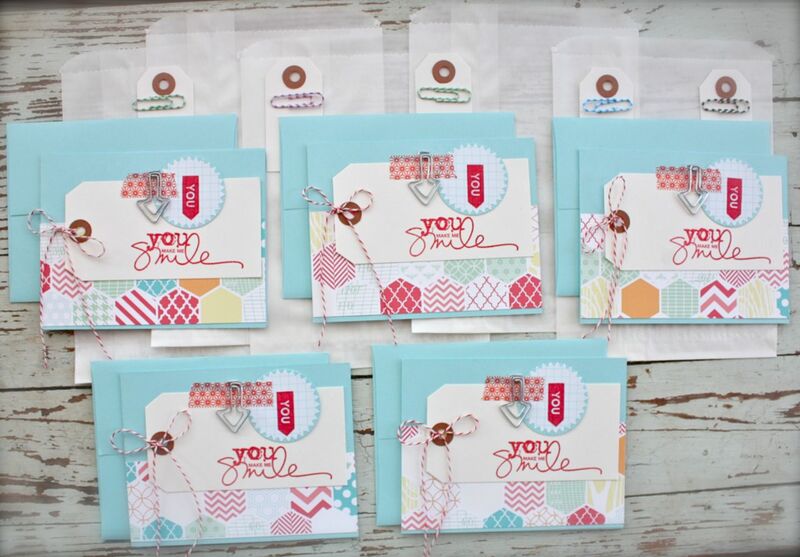 Use the card fronts and envelopes to create your own card design then package them all up in the clear card box. Wrap the seam binding around the clear box and tie a ribbon. Then use the aqua/white baker's twine to tie on the tag. A great way to get a head start on some teacher or Christmas gifts. Which is exactly what I plan to do with my cards.....keep at least one for my stash then divide the others up for Christmas gifts. I love that I'm building up my stash...and it's still August! 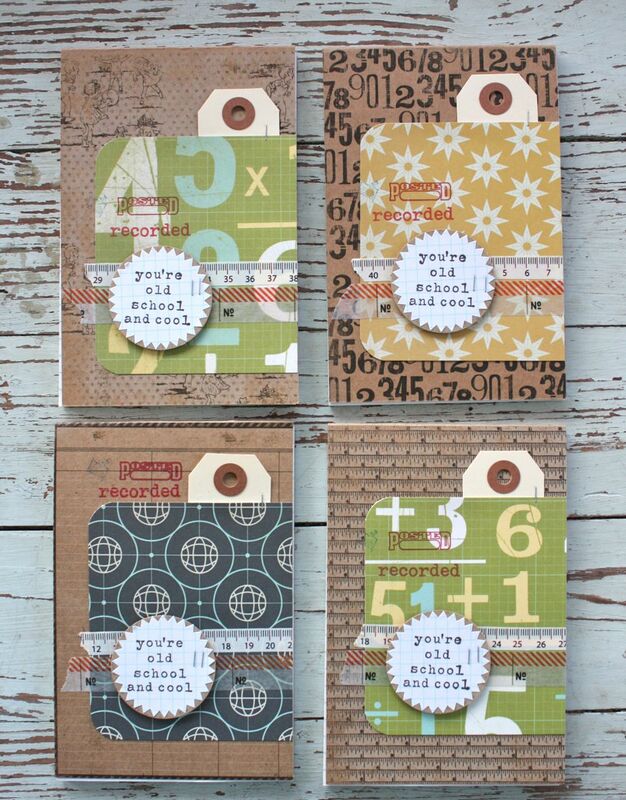 And speaking of teacher gifts, I've got a handful of the 2 Squared School Kits still available in the shop. Quantities are very limited so get 'em while they last. You can click on the posts which feature projects made with this kit here, here, here ,here and here. Ya, I got a lot of mileage out of that kit! 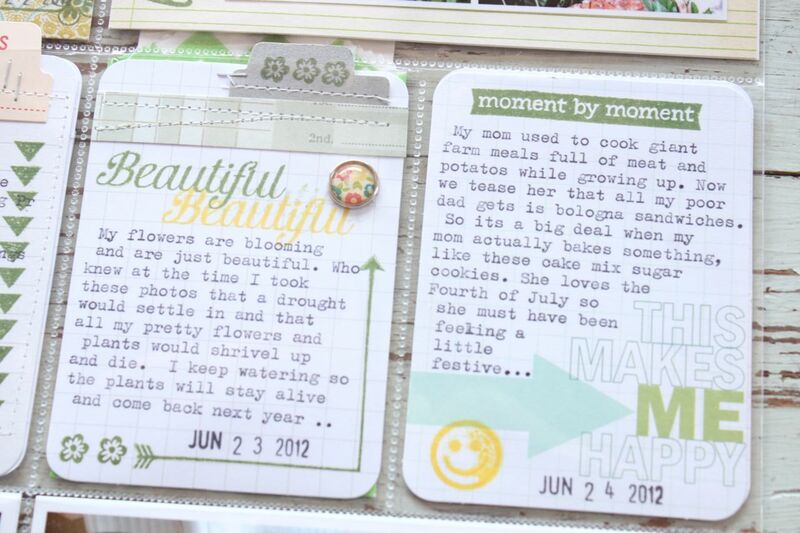 Stay tuned for just a few more projects that I made using that kit...coming in a blog post soon. Okay, I'll be working over at the shop to get the items listed. They'll be up shortly. 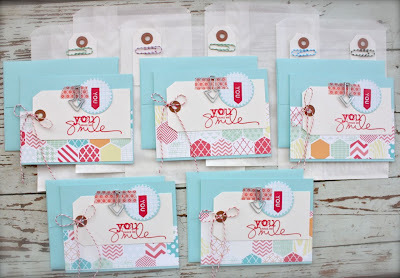 Look for the main You Make Me Smile Kit, the Happy Stamper add on kit, the Tag Kit and the Cards & Envelopes kit. Wow, I'm finally able to sit down to work on a blog post. 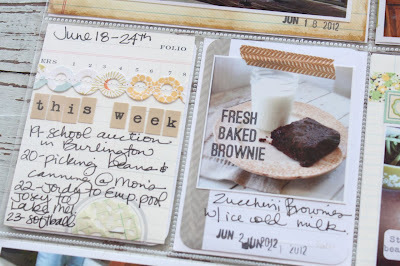 This past week was filled with purging and getting ready for a big garage sale we had yesterday. SO, so glad that is over. I'm energized now to purge more and get my house more organized. I have some more thoughts on this but that will be for another blog post. Today I have some projects that are the result of a stamping session that happened all for the sake of creativity. Now that I'm not currently designing for a company that sells stamps, papers, embellishments, etc I am afforded the opportunity to just create. To just see what happens down in the craft department. It's been nice to see what happens and to see what evolves when there's no pressure to use a certain product. And that brings up my main thought for today.....the process versus the product. What happens when you don't focus on using any certain products? Have you sat down and created something that isn't for a challenge or to see what other people think? 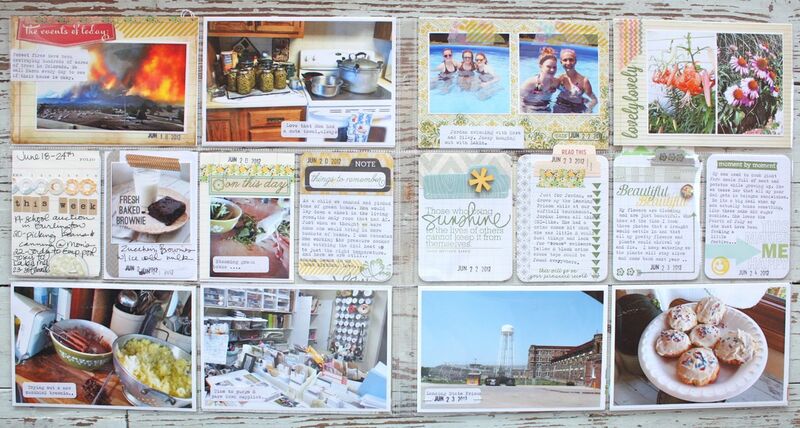 If you're a blogger, have you created with the mindset that this project is for me? Not for anyone else to see on my blog? 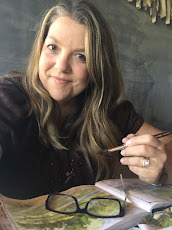 I think that sometimes we are so caught up in what we should be creating or how a project should look or what products we should be using that we forget about our own true style. That we forget about how fun and nurturing the creative process is in itself. So with all that said, I'm going to share my projects with you today. But keep in mind that these cards were created with the idea that I just wanted to create something. Nothing else. You might enjoy the thought process I share along the way.....and I hope you are inspired to create just for the sake of making something. 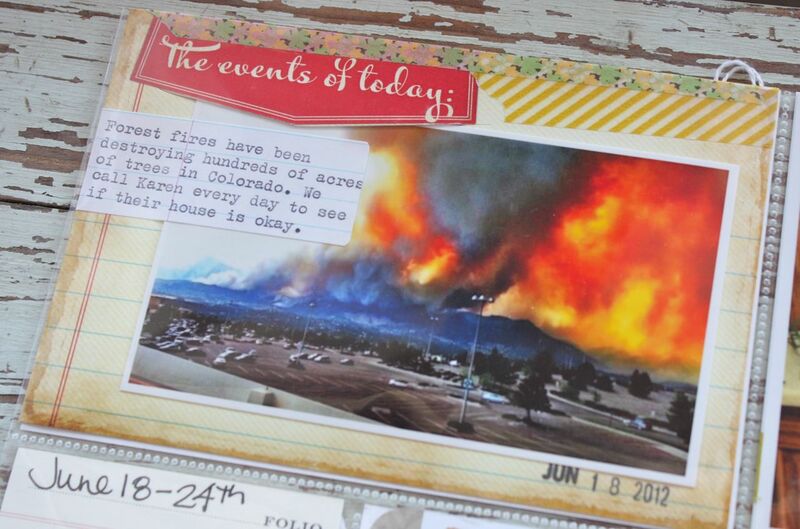 For my projects I used a collection of My Mind's Eye papers, stamps and embellishments that I recently ordered from 2Peas. Please leave a comment if you have any questions about a certain product. I also had this sketch laying around that I created so I used it as a creative starting point. First up I just wanted to be creative. I had lots of fun patterned papers to work with but I wanted something that looked handmade and a little artsy. 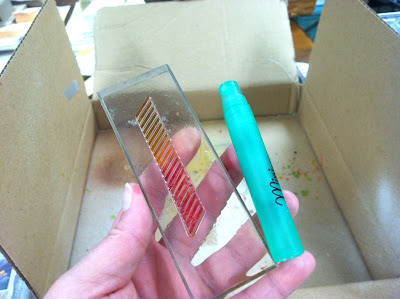 I reached for a striped MME stamp, 3 colors of inks and a small misting bottle full of water. Here's what I ended up with. Fun strips of striped patterns that have a water colored look to them. 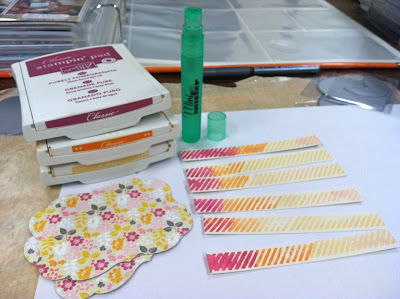 I just inked up my stamp with the lightest yellow, then the orange then the dark pink color......then misted with water....then stamped the image on strips of cardstock. Again, just for fun, just for the sake of being creative and to see what I could come up with. So next I got started with my first set of cards. 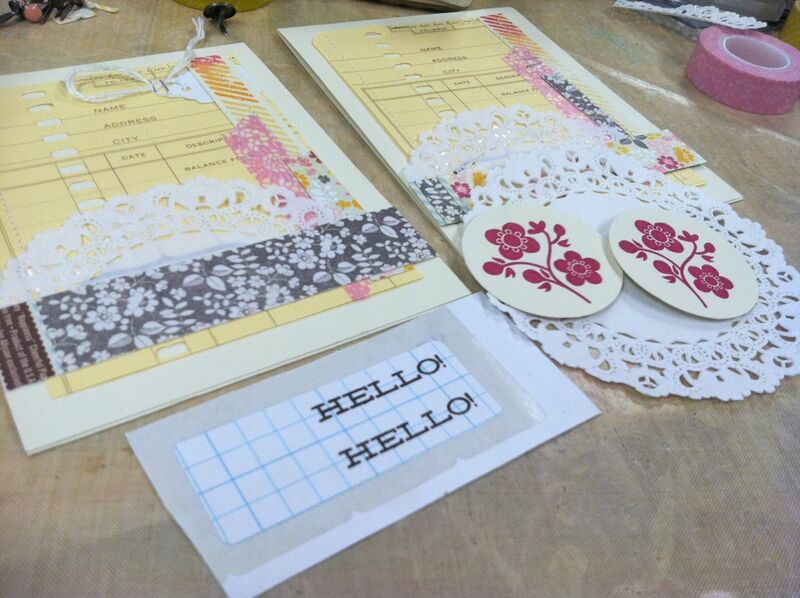 In keeping with the sketch, I used a large Papertrey label die that I cut from patterned paper + a neutral cardstock. I'll end up using one half from each for my cards. 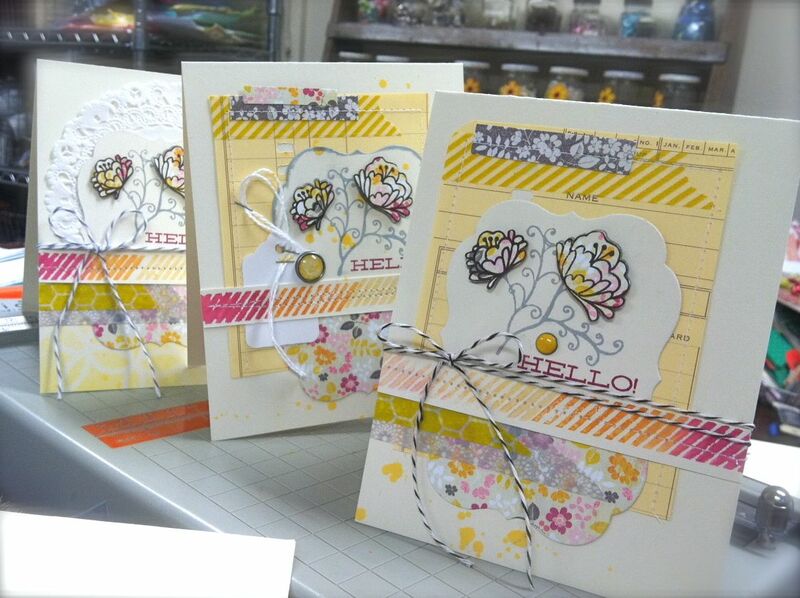 The main focal point of these cards will be the large label image with some stamping and lots going on in the foreground. Once I had my labels kind of pieced together, they didn't stand apart from the base card very much. So I decided to stray from the sketch a bit and created a background using ledger paper from my stash + a few scraps and some Washi tape. Just layered quickly onto the background piece and then stitched. This got me very excited to just take a creative session to just make backgrounds. 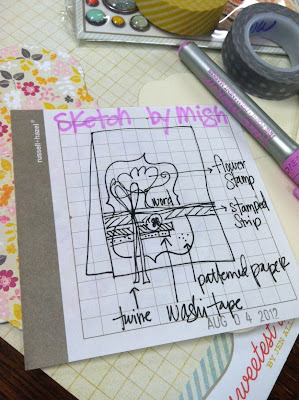 Again, the creative process came into play much more than any product I was using. So fun! And here's 3 finished cards that I made, using the sketch + my handmade water colored strips + some fun accents and popped up stamp images. I really do like how these turned out. Those scrappy little backgrounds got me so intrigued that next I wanted to create some cards that focused more on the background than a large focal image. These came together very quickly by just adding some of the leftover watercolor striped paper I made, some Washi tape, some scraps of paper and a few Small White Tags. When working on the first cards, I felt a little confined to my detailed sketch. So this time I just rolled with whatever popped into my head. 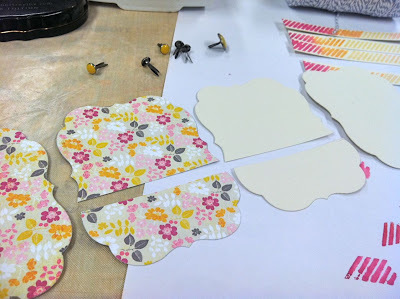 I reached for some Dainty Doilies, stamped up a few Grid Paper Labels and then stamped some MME flowers onto punched circles. I didn't quite know how my cards would come together but I just let the creative process take place. I knew these cards would just go into my stash so whatever came about was just fine. And here's the end result. I love how quickly these came together versus the time it took me to put together the cards using the sketch. But I loved working on both sets of cards. Sometimes it's detailed that you want, other times it's quick and easy. Notice that I also made a coordinating envelope using some Washi tape and Studio Calico stamp (which I cut apart to fit my liking). For a final set of cards I wanted to explore the handmade backgrounds a little more. I like the idea of starting with a piece of "something" that has a pattern on it. Above I used my ledger papers and this time I reached for some Library Cards. 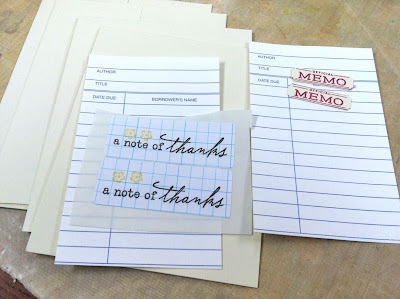 I didn't have a plan for the card design but I liked the idea of using the stamped Grid Paper Labels again along with some tiny stamped labels. 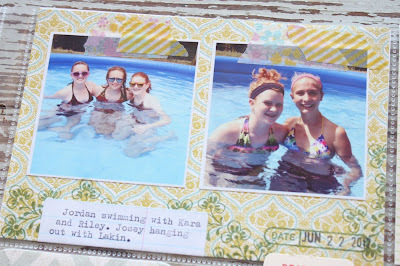 I started out by laying on strips of paper and Washi tape on the base card. They needed a little pattern to start off with. 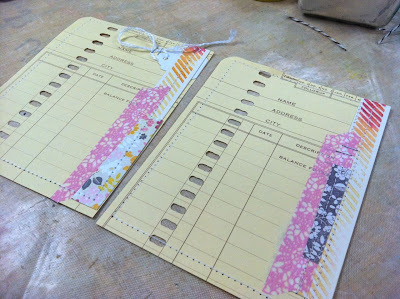 Next I just worked on layering stuff to the library cards. At this time they are not attached to the card fronts. The fun part of this process is that you can work on the background piece and get it all finished before attaching to the card. 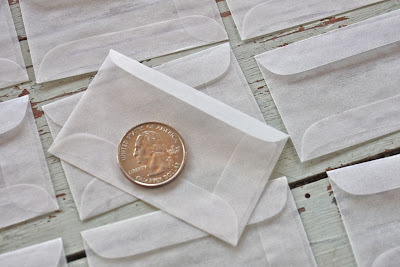 This way you can layer and wrap tapes around the back of the piece and even machine stitch and staple on the piece without it all showing on the inside of the finished card. You can look at the above photo and then how I added more layers and stitching to the piece in the photo below. 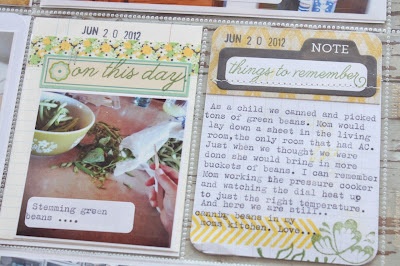 This might be a new favorite way to make cards.....all because I just let the creative process flow with no finished product in mind. And heres's my two cards. I topped the layered background with more Washi tape, the stamped Grid Paper Label, hand cut/stamped flowers and some Studio Calico wood veneer hearts. Notice how I let the small "memo" label hang over the edge of the library cards. The labels look like they flow from one layer to the next. That's an easy way to tie the background layer and the main base card together. And one more thing that was was fun to do....I cut tiny strips of Washi tape and used them over and under my flowers and veneer hearts. I love this look and will be using this technique again soon. 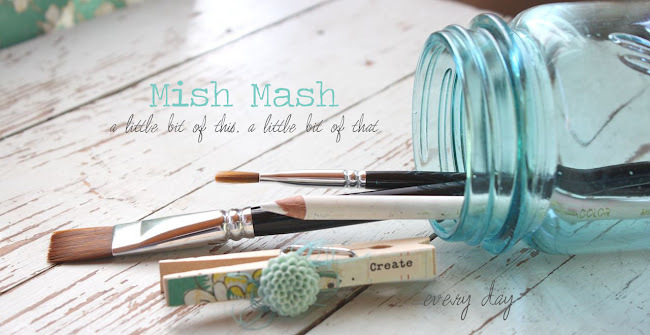 Amazing how you discover little creative tidbits when you sit down to just make something. The girls have more volleyball practices and then it's back to school later in the week. Both my reds are going to be in high school now....and driving.....and dating boys....OH MY! I have to say that I really love teenagers (if they're not bratty and annoying, that is). They make me feel young again and full of adventure. I'm looking forward this school year!